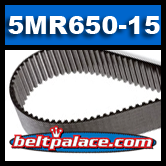 Timing belt 5MR650-15. 130 Teeth. 25.59" Pitch length. 15mm Wide - Timing belt for scooter motor. Description: High density 5mm rubber belt. The PowerGrip® GT®2 belt has TWICE the load carrying capacity of its predecessor HTD®. PowerGrip® GT®2 belts are suitable for many applications such as HVAC, office machines, machine tools, hand power tools, postage handling, spindle drives, food processors, sewing machines, robotics, linear and light package conveyor. Also used on electric/gas powered scooters. Replacement drive belts: 130 Teeth, 25.59 inch Pitch length, 15 MM Wide. Fits PowerGrip® GT®2 and Poly Chain® GT® Sprockets.